1. I threw on a rough outline of the shape of the snake. 2. 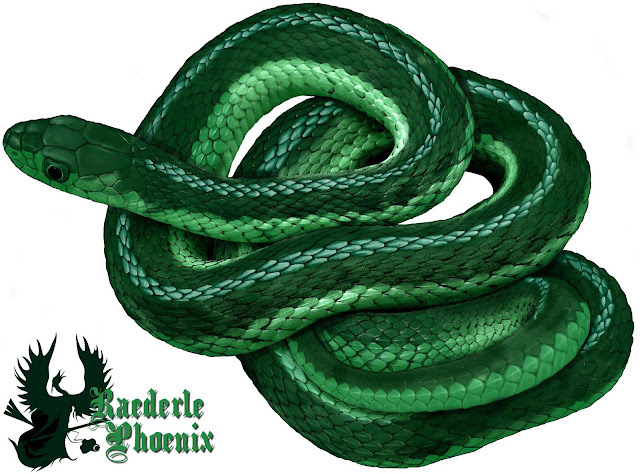 I added a dark outline around the edges of the snake, mostly as a guideline. 3. I sketched out the scale shapes. 4. I deepened scale-shape shadows in places. 6. Added some color variety. 9. Brought out the lighter tones. 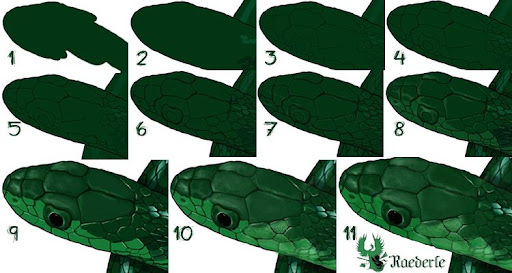 1.First I established the basic outlines of the snake. 2. I went on to begin carving the scales out of the snake in a very monotonous way, which I will probably never do again with any piece ever again. Incredibly boring to sit about outlining scales. 3. I added spots of coloration, almost whimsically to try and discover what would look most attractive. 4. I put in the main shadows. 5. I began to add scale shadows in earnest, as well as mocked-up highlights. 6. I decided to made the underbelly a lighter color. 7. I highlighted and textured many of the scales. 8. 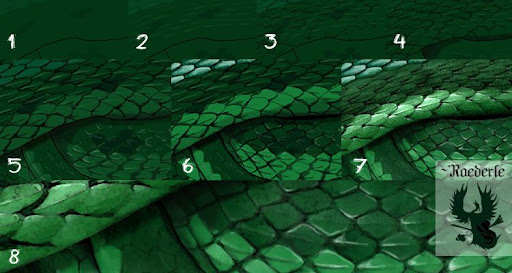 A small clipping here is displayed of the fullsize detail of the scales. 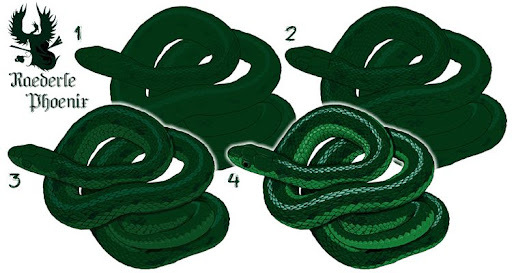 The current condition of The Garden Snake. The version on my computer is over 20 inches on a side. This is a very, very detailed work, and what you see on your screen is a compressed tiny rendition.